I recently tried out Blue Apron. They're a cook your own meal delivery service that's fairly similar to Plated which I had previously reviewed. I'm not going to do a full scale review since it's pretty much the same concept. I will say that I wasn't really impressed mainly because they sent me the dirtiest head of lettuce ever and yellowed cucumbers that weren't even usable. Also their meals took me double the time it takes me to prepare my usual recipes. They turned out pretty well despite that but these two strikes along with the fact that you can't actually make specific meal selections is enough that I probably wouldn't cook with Blue Apron again. My favorite out of the 3 dishes we received was this pan seared drum and tomato jam with Himalayan red rice risotto. I liked that it introduced me to a new fish, drum which is a mild flaky white fish and a way of serving fish that I don't normally do. I did have to made some adjustments to the recipe on the fly while cooking. Two tablespoons of sugar seemed like an obscene amount so I reduced it to two teaspoons and subbed coconut palm sugar which I generally use in place of white sugar. The tomato jam was still plenty sweet. Also the description for the Himalayan red rice as a risotto was completely off. Texturally it's actually more like brown rice and required more water and about triple the amount of time suggested in the recipe to fully cook. I also found that one cup yielded more than two servings, for us at least. Still I did like the concept enough that I would make a variation on this again probably with tilapia in place of the drum cause I'm not sure where to find it and use forbidden rice instead of Himalayan red rice. Here is the adapted recipe. Wash and dry the produce. Peel and mince the garlic. Pick the thyme leaves off the stems and discard the stems. Peel and small dice the onion. Trim off the ends of the asparagus and cut the stalks on angle into 1 inch pieces. In a small pot, heat 2 teaspoons of olive oil on medium until hot. Add half the onion and season with salt and pepper. Cook, stirring occasionally 2 - 3 minutes or until softened. Stir in the tomatoes, vinegar, thyme and sugar; season with salt and pepper. Simmer, stirring occasionally, 18 - 20 minutes or until thickened. Remove from heat and season to taste as needed. Set aside as you finish cooking. While the tomato jam simmers, Heat 2 teaspoons of olive in a medium pot until hot. Add the garlic and remaining onion and season with salt and pepper. Cook, stirring occasionally 2 to 3 minutes, or until softened and fragrant. Add the rice and cook, stirring more frequently 1 - 2 minutes, or until lightly browned. Add 3 /2 cups of water to the pot of toasted rice and season. Increase the heat to medium high and bring the mixture to a boil. Once boiling, reduce the heat to medium low, cover and simmer, stirring occasionally, 35 - 40 minutes or until the rice is tender and most of the liquid has been absorbed. Add the asparagus to the rice and cook 1 - 2 minutes or until tender and bright green. Turn off the heat and stir in the butter until melted. Set aside in a warm place as you finish cooking. Dry and season both sides of the fish fillets with salt and pepper. Heat 2 teaspoons of olive oil until hot in a medium non-stick pan. Add the fillets and cook 2 - 4 minutes per side or until crisp and golden. Transfer the cooked fish to a paper towel lined plate. 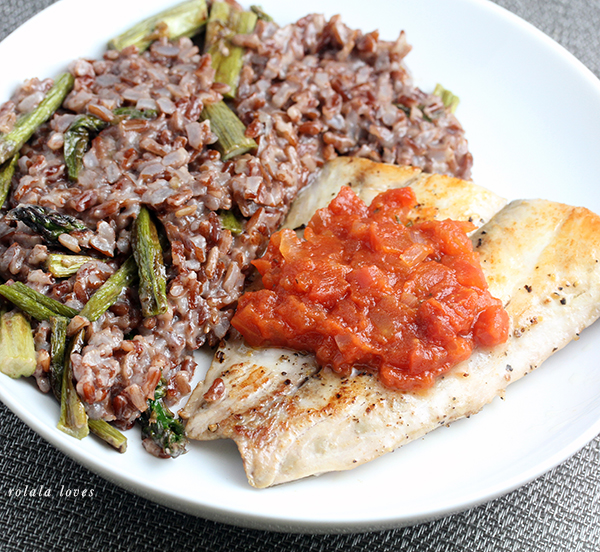 To plate the dish, divide the cooked fish and risotto between 2 plates and top with tomato jam. I have SO much trouble pan searing fish. I always end up with uncooked fish, or it falls apart in the pan. But this looks delicious! I really like this style of post from you because we can learn so much. This looks incredibly delicious. I love fish, but I will have to try that Himalayan rice with it as well. Absolutely gorgeously gourmet. My husband loves fish, however, I hate touching it when it's raw! That rice looks amazing. This looks delicious and easy to make need to try always looking for new recipe with fish thanks doll. That's horrible that they sent you dirty lettuce and yellowed produce. Quality must not be a priority with them :( Good for you in making the best out of the situation Rowena. It looks delicious. that's too bad. but what you cooked up despite everything looks great! This looks so good. My son would love it fish is his favorite. I'll copy this recipe immediately!!! Such a pity about the quality of the fresh produce, but the recipe sounds really interesting. Thanks for your comment... Hope you have a fantastic week ahead! OHH! I love this. I have wanted to try Blue Apron as well but have not signed up officially. This is very inspiring! Oh my this recipe does sound good!! I am book marking this for sure. And egads that service does not sound good at all. If they see this review hopefully it will inspire them to improve their service. Great recipe, I would like to try it!!!! Ohhh so yummy :9 Thanks for the recipe. Oh my word, this look delicious! Definitely going to have to try this one myself! Fish os one of my favorite meal! Oh that looks delicious even if the experience was less than smooth! I've never encountered drum either. I wish I could have this for lunch today! Looks good. I like the flavors that tomato's add to dishes. I think this kind of service is a great idea, we don't have it in Italy. You did a great job Rowena! That's sad you had a disappointing experience but at least you got an adaptable recipe out of it! I hope you had a great holiday!! Looks delicious and so healthy!! That is one yummy looking plate! Well, this is the most delicious looking thing I have seen in a while. Oh the pan-seared drum fish dish looks so gorgeous. I wonder what a drum fish is and how it tastes like! Is red rice the same as unpolished brown rice in Asia? This dish looks absolutely droolicious. A pity about the dirty lettuce and yellow cucumber aside from this. This is an interesting concept... cooking your own dishes in a delivery service. We don't have this here.